This hands-free, no-touch delivery process speeds deliveries and ensures accuracy of delivery placement to the right loction, at the right time. Our NEW CarryMax™ Heavy-Duty Trailers are designed to carry your heaviest loads with ease. 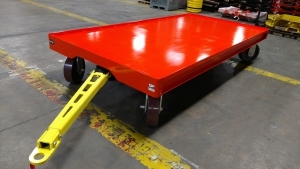 These industrial trailers can carry up to 30,000 lbs. each. Removing Fork Trucks on the Line is Now Imperative. 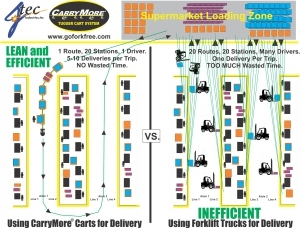 If you are still like MANY manufacturing and assembly operations, you are still using some fork trucks to deliver materials from your docks, company store or supermarket to replenish line needs, sometimes long distances apart. Consider manpower costs, safety exposures and productivity rates with one operator delivering one pallet or container of goods to one spot in your facility. That’s just the start. Liability issues are expediting this need, fast outpacing cost and productivity limitations. Statistics show that forklift traffic incidents continue to be the NUMBER ONE safety risk at most sites. Visibility and maneuvering limitations from bulky loads and trucks can lead to accidents involving workers, equipment, storage racks and other materials in the path of these vehicles. Backing up, lifting items off of the pallets and more in heavily trafficed areas adds risk once items are delivered. 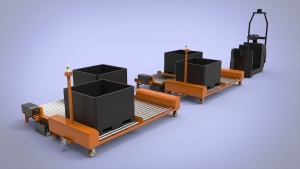 The Jtec CarryMore® Tugger Cart System has proven to be many times more cost effective and useful than forklift deliveries in customers’ locations who have implemented it. 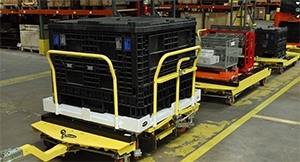 One operator can deliver multiple full pallets or container loads; full kitting carts ready for assembly use; separated hoses and specialty parts to the line where needed; all in ONE trip. Savvy users are calculating delivery replenishment times at each stop and scheduling carts — often pulled in one safe, directional path through the facility, to arrive exactly when needed. Over and over again. It’s really what LEAN manufacturing is all about. I Need More Information About Jtec Products!